This is Australian politics’ biggest scandal, and the most powerful people in the country are ensuring you know as little about it as possible. There’s been minimal coverage (outside reports in the Canberra Times) of the government’s campaign of harassment and intimidation of Witness K and Bernard Collaery this year. And that’s exactly the way the government likes it. It appears that Attorney-General Christian Porter is doing everything possible to slow the prosecution of K and Collaery down. With a slower prosecution there’s a greater chance the media and public will lose interest, and a larger toll for Collaery too; while he’s being prosecuted in the same courts he practiced law, it’s impossible for Collaery to fully resume his career. A jury could hear the controversial prosecution of a former spy known as “Witness K” and his lawyer who are both accused of revealing information about the Australian government spying on East Timor, a court has been told. But before the question of any committal or possible jury trial could be decided, on Thursday a preliminary hearing in the case to be heard in secret was set down for August. Tim Begbie, for the Commonwealth, said that since the matter was last in court Attorney-General Christian Porter had issued certificates under the National Security Information Act over the brief of evidence. He said that, in broad terms, the certificates permitted the brief of evidence to be disclosed subject to certain restricted circumstances such as where it can be viewed. He said there was also an unclassified version of the brief. Because the Attorney-General has issued those certificates, the matter is headed for a closed court preliminary hearing in the ACT Magistrates Court to consider how sensitive material will be dealt with. Mr Begbie passed to the court a set of proposed orders leading up to the hearing. The preliminary hearing was set down for August 6, 7, and 8 this year. But also raised in the course of Thursday’s mention in the ACT Magistrates Court was the possibility of a committal to the ACT’s higher court, which both lawyers for Witness K and Canberra lawyer Bernard Collaery flagged. Mr Collaery’s barrister, Christopher Ward SC, said they were considering the question of a jury trial but were not yet in a position to decide because they had not been able to sit with their client and review the evidence. The federal government has flagged the likelihood of the case of a former spy and his lawyer accused of conspiracy being held in closed court to protect information it says could prejudice national security. Witness K – a former operative for the overseas spy agency the Australian Secret Intelligence Service – and his lawyer Bernard Collaery were charged in June with conspiring to release secret ASIS information, after they blew the whistle on a 2004 operation to plant listening devices in the cabinet room of Timor-Leste’s government. The bugging operation came during negotiations with the Howard government to settle the maritime boundary that would carve up lucrative oil and gas rights between the two countries. Mr Collaery had been representing Timor-Leste in its dispute with Australia.In November, ACT Chief Magistrate Lorraine Walker adjourned the case while Attorney-General Christian Porter determines if the brief of evidence against the pair contains material related to national security information. Such a move could see the trial held behind closed doors, while provisions of the National Security Information Act could see lawyers for the defendants excluded from hearings if they do not have the required security clearance.Lawyers for Mr Collaery, a former ACT attorney-general and deputy chief minister, were yet to undergo a clearance late last year. The act also allows defendants themselves to be excluded from a hearing. If Mr Porter deems the brief of evidence is likely to prejudice national security, a preliminary hearing would be held to consider the material in a closed court. Australia owes a great deal to the winners of the 2018 Person of the Year. In 2018, the people we invited our readers to vote for Person of the Year were largely people who pushed back against all that is degraded and hopeless about public life in Australia. This is particularly true of the pair our readers deservedly voted in — a principled stand, a much needed source of hope, or at the very least energy, that hasn’t gotten nearly the attention it demands. John Richardson writes: If the trial judge in the Bernard Collaery/Witness K trial is persuaded to conduct proceedings in secret, which may have the effect of denying the accused a fair trial, then that judge will have imposed nothing short of an authoritarian system government on this nation and rendered the judicial system entirely redundant. Every member in every parliament throughout the country should be screaming in protest against this corrupt attack on the independence of the judiciary, the base assault on our democratic rights and freedoms and the abuse of power being perpetrated against the accused by the executive. AR writes: What is the point in letting the accused know the evidence against them — they’d probably deny it and waste valuable court time. Just go straight to sentencing, stop mucking about. 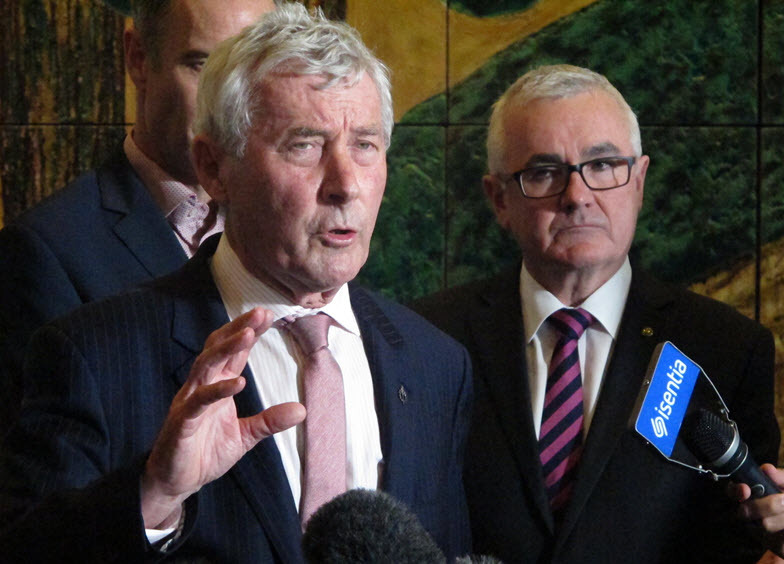 The undisclosed brief of evidence against Witness K and lawyer Bernard Collaery is set to be the subject of a closed court hearing to judge national security information in the prosecution of the pair for disclosing the fact Australia spied on Timor-Leste. On Friday whistleblower Witness K and Collaery suffered a setback, with the ACT magistrates court refusing their applications to have an earlier open court hearing on whether protected information in the case is likely to prejudice Australia’s national security. Prosecutors in the case have given notice the crown’s brief of evidence is expected to disclose national security information, and as a result the court and defendants are yet to see the brief pending a decision on how to handle it. That notice is likely to trigger the attorney general, Christian Porter, to issue a certificate of non-disclosure which leads to a closed hearing for the court to make its own judgment about whether information is likely to prejudice national security. The chief magistrate, Lorraine Walker, told the court that laws granting a closed hearing could be “clearly potentially prejudicial to the defendants” because lawyers for the defendants “may not be entitled to be present” if they do not have a security clearance.